The Pentland Hills are easy to reach, just south of Edinburgh. Plenty of walks to discover on their breezy slopes, if you get tired of city attractions! They offer a great view of the Lothians - as well as the Border hills southwards and the edge of the Highlands to the north. 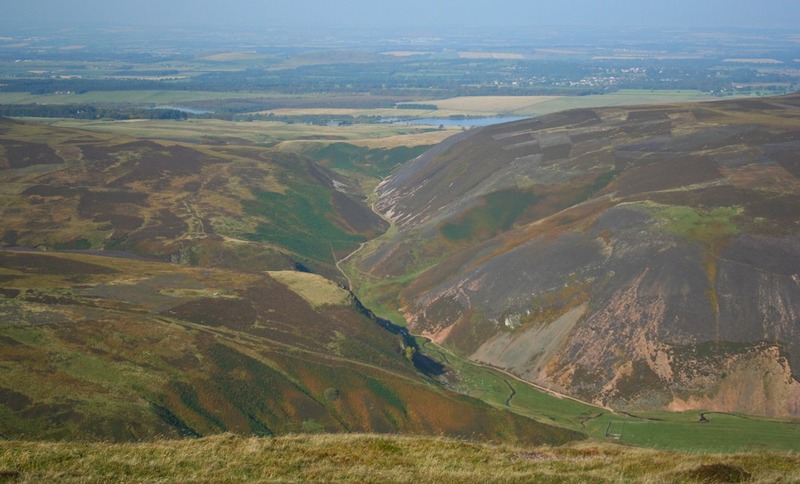 The Pentland Hills are the rolling tops and reddish scree slopes you see from several Edinburgh high-points. And lucky old Edinburgh to have them on the doorstep, so to speak. You would think that all that down-town theatricality of castle and crag, fine facades of neo-classical columns and ‘Athens of the North’ stuff would be enough for any city. But, no. Edinburgh also offers this fine wee range of hills to experience, should you want to take time out from all its other attractions. If you don’t take the car, then you can still get access from the city to the Pentland Hills for £1.60, per single adult, the last time I looked. At least, that’s the bus fare from the city centre and a No 4 will get you to Hillend, for instance. Remember, too, that thanks to Scotland’s liberal access legislation, the so-called ‘right to roam’, you are most welcome to wander (or even stravaig as that’s a good Scots word) wherever the paths take you. And there are lots of paths through these heathery knowes (Scots: knolls) and valleys. In autumn, looking north from Scald Law, Pentland Hills, to the Bavelaw path in the valley below. City of Edinburgh to the right. “There are the hills of Fife, the hills of Peebles, the Lammermoors and the Ochils, more or less mountainous in outline, more or less blue with distance. Of the Pentlands themselves, you see a field of wild heathery peaks with a pond gleaming in the midst; and to that side the view is as desolate as if you were looking into Galloway or Applecross. 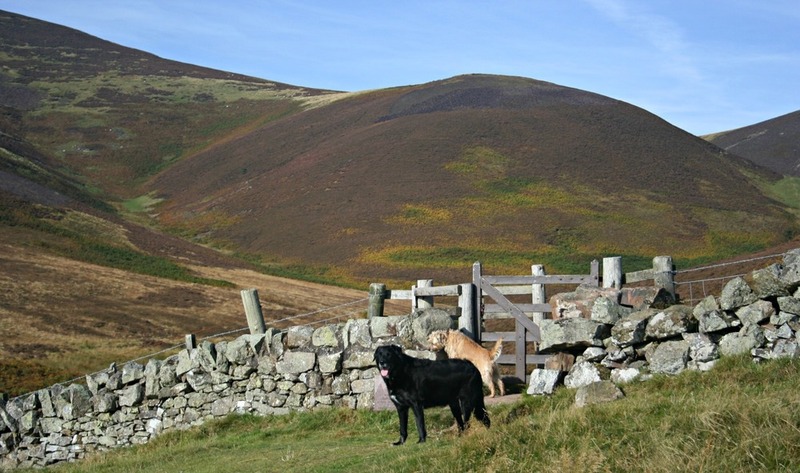 (Pictured here with two dogs) The path goes from the A702, east of Silverburn, through the Pentlands between Scald Law and Carnethy Hills. Signposted Bavelaw and sometimes called The Old Kirk Road, at least on the Pentland Hills Regional Park map. Scald Law, where the first picture above was taken from, rises on the left of this low-level pic. Doggies ready for the walk, but waiting as they never ever managed to figure out how to open ‘kissing gates’ for themselves. Anyway, except for the long-gone smoke that gave the old city its label of ‘Auld Reekie’, Stevenson’s description is exactly what you see today from any of the tops of the Pentlands. Just as he said: Fife across the Firth of Forth to the north, then down the coast towards the beaches of East Lothian, further round to the long line of the Lammermuir Hills, marking the Southern Boundary Fault. And, away to the north-west, the real hills of the Highlands – Ben Ledi and the others – in short: you can see out of the central belt of Scotland both to north and south.The picture below looks north-east from Carnethy Hill. (Pictured here.) Carnethy Hill looking towards Turnhouse Hill with the East Lothan coastline in the haze. Altitude a mere 576m / 1889ft. Of course you’d manage that….hmmm, but perhaps not in those shoes…. Stevenson’s original descriptions and his clear appreciation of his local hills are in his ‘Picturesque Notes’ (1879), a text much pillaged through the years by guidebook writers. In Stevenson’s day, obviously, there was more green space between the city and the upland and in his wonderings he probably did not meet mountain bikers. Today, they are just one of the recreation groups who use the hills. Nice people, all of them. Even in a place only a few minutes’ drive from the anonymity of the city, the healing effect of the outdoors shows itself by the way that total strangers say hello in passing. The pictures here were from an autumn Sunday afternoon excursion. It coincided with a local running club’s hill-race, or what they picturesquely called a ‘skyline race’. In place, well ahead of the runners, a high-viz jacketed marshal stood on the summit of Scald Law and was happy to explain it all. I sat in the autumn sunshine nearby and watched him chat to other walkers and passers-by and point out local landmarks. And, in spite of their popularity, as close as these rolling tops are to the city, there are still places where you can have the slopes of heather and coarse grass all to yourself. If you get the angle right, then Stevenson’s comment about the view being desolate is still true today. Or at least, on a sunny Sunday in autumn. The only change is that Stevenson’s ‘desolate’ becomes ‘unspoilt’ in Scottish copywriting speak. Finally, though the slopes of heather may remind you of the Highlands, linguistically speaking we are a long way from the Highlands. The Pentland Firth crossed by the connecting ferry to Orkney at the top of Scotland is really ‘Pict-land’. But down here the Pentland Hills are from early Welsh ‘pen’ meaning hill or top (cf Penicuik, the town near the Pentland Hills). The ‘land’ part is ‘llan’ – a common enough Welsh element meaning church, though sometimes also enclosure. I hope all this general enthusiasm will inspire you to pay the city's hills a visit. For up-to-the-minute views of the fine and breezy ambience of the area, check out this Pentlands webcam. Robert Louis Stevenson followed a literary calling. Though abroad for much of his life, Stevenson's love for Scotland shines through in his writing. These east Scotland coastal walks are ideal if taking a break from driving the main A1 between Berwick-upon-Tweed and Edinburgh.